This entry was posted in PHP, Runa-CCA, Twilio on 2014年5月6日 by rutoru. In the case where a call is dequeued due to a REST API request or the verb, the action URL is requested right away. In the case where a call is dequeued via the verb, the action URL is hit once when the bridged parties disconnect. If no ‘action’ is provided, Twilio will fall through to the next verb in the document, if any. The ‘url’ attribute takes an absolute or relative URL as a value. The url points to a Twiml document that will be executed on the queued caller’s end before the two parties are connected. This is typically used to be able to notify the queued caller that he or she is about to be connected to an agent or that the call may be recorded. The allowed verbs in this TwiML document are Play, Say, Pause and Redirect. StatusCallback occurs asynchronously and after a call has completed, this is an opportune time to update properties of your local call record. Your application also has more flexibility at this time to process database updates or compile larger reports without impacting user experience. 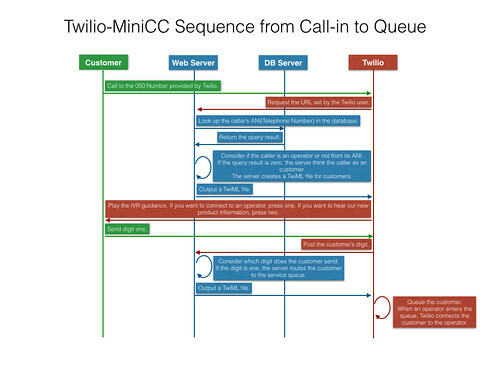 This entry was posted in Twilio on 2014年4月20日 by rutoru. This entry was posted in Ruby, Twilio on 2014年3月30日 by rutoru.